Raqqa, Syria, which was once the Islamic State’s self-declared capital of their caliphate, has nearly been liberated from the terror group’s control. U.S.-backed forces announced Tuesday that “major military operations” in the city are over. 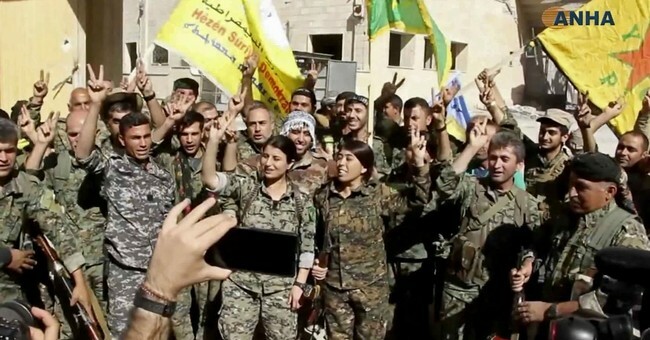 "Major military operations in Raqqa are finished but they are now clearing the city of sleeper cells -- if they exist -- and mines," Talal Salo, spokesman for the US-backed Syrian Democratic Forces, told CNN. The S.D.F. is the American-backed militia of Syrian Kurds and Arabs. "The situation in Raqqa is under control and soon there will be an official statement declaring the liberation of the city." The announcement marks an end to a three-year reign of terror in the city and comes after an intense four-month battle. The 200-some militants who remained agreed to give up the fight and were bused out of the city to the last remaining areas to the south that are still under ISIS control. According to Col. Ryan S. Dillon, there were still some ISIS-controlled pockets in the city. Moustapha Bali, a spokesman for the S.D.F, also cautioned that suicide bombers could still be in the city. He also told Pentagon reporters that IEDs are littered throughout the city and could take years to find and remove. Nevertheless, that didn’t stop soldiers and Syrian residents from celebrating. Vice President Mike Pence also spoke about the news from Raqqa Tuesday on Hugh Hewitt’s radio program.